Medical Mathematics, Cell Biology, Systematic Anatomy, Histology and Embryology, Physiology, Biochemistry, Immunology, Microbiology, Pathology, Medical Genetics, Experimental Physiology, Pharmacology, Pathophysiology, Parasitology, Regional Anatomy, Diagnostics, Image Diagnostics, Nuclear Medicine etc. Students need to do one year's internship in China, their home country or any other countries. 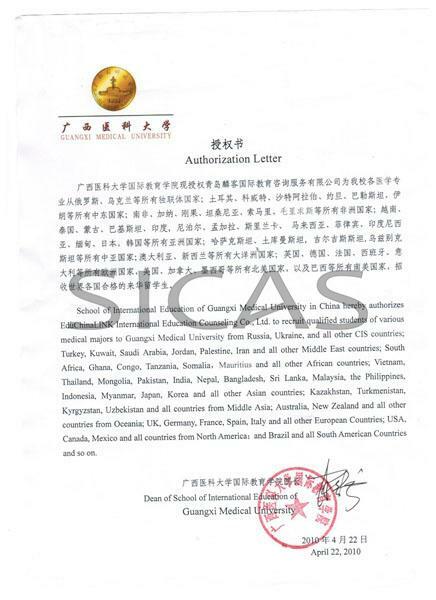 GXMU highly recommends students to do it in China and they will be arranged in The First Affiliated Hospital, which is one of the 100 best hospitals in China. And before internship, students need to pass HSK 3 to contact with the patients. See more details, please visit the Internship and Career. Insurance Fee: RMB600 per year. On completing the requirements of the teaching program and passing the graduation examinations successfully, international medical undergraduates will be granted a graduation certificate and conferred a medical degree by GXMU, if they meet the degree regulations of the university. The English copy of the degree will state MBBS (Bachelor of Medicine and Bachelor of Surgery). Applicants should be in good health, high school graduate or above, or have passed Grade Twelve (10+2)/FSc./A Level/WAEC or equivalent.